Microsoft's quarterly earnings this week showed that while commercial sales of Windows 10 PCs are on the rise, consumer interest remains slack. Windows remains in a revenue rut, with commercial sales up courtesy of Windows 10 but with consumer sales down as individuals continue to eschew PCs, Microsoft's latest earnings report revealed this week. Specifically, Windows revenue was up 6% during the September quarter to approximately $4.6 billion, or about 42% of the total for the More Personal Computing group, the accounting line containing Windows. Microsoft again attributed the growth to sales of commercial-grade licenses - Pro or Professional versions - to OEMs (original equipment manufacturers), the computer makers that assemble and sell PCs, and to what it labels "Windows Commercial," which is largely composed of volume license sales of the operating system's Enterprise and Education SKUs (stock-keeping units). "We saw healthy Windows 10 commercial deployments as the OEM ecosystem continued to benefit from customer demand for modern and secure software and hardware," Amy Hood, Microsoft's CFO, said in Wednesday's earnings call with Wall Street. 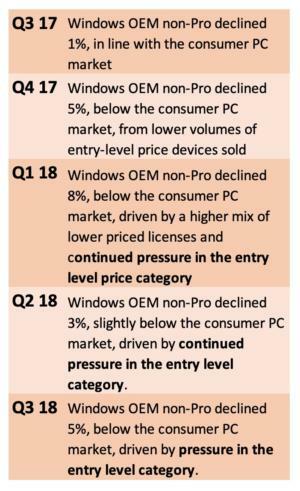 "OEM Pro revenue grew 8%, a few points ahead of the commercial PC market, from a higher mix of premium licenses. 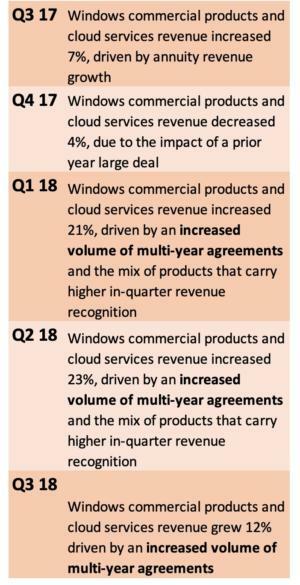 Windows commercial products and cloud services revenue increased 12%." The phrases Hood used for all three categories - commercial Pro OEM, consumer non-Pro OEM and Windows Commercial - have become a regular part of Microsoft's earnings liturgy. Consider the language used in Microsoft's earnings slides over the past five quarters to describe consumer-grade OEM sales, for instance. The similarities between the quarters' explanatory text, particularly the identical phrase of "pressure in the entry level category" in the past three, illustrates the same-old, same-old nature of Windows on the consumer side. During Microsoft's fiscal year 2018 - which ran from July 1, 2017, to June 30, 2018 - Windows consumer OEM revenue was down 4% from the year before. Windows commercial OEM revenue and that of the Windows Commercial category, however, were up 11% and 12% in fiscal 2018, Microsoft said. The increases in the September quarter were 8% and 12%, respectively. Those revenue buckets were also described in language that rarely strayed from a theme, again showing how they had become the default growth sectors of Windows. It's unclear how Microsoft assigns revenue from SKUs that mix Windows with other products, such as the relatively new Microsoft 365. That subscription-based product combines Windows 10 Enterprise with Office 365. But Microsoft's Hood argued that Windows revenue, at least that portion from business customers, is on a run as long as companies scramble to get out from under the soon-to-retire Windows 7 and onto Windows 10. "That end of (Windows 7) support is about five quarters away, so we'll continue to expect good signal and good demand in that Pro segment," Hood told financial analysts. Windows 7's free support - which at this point is limited to security updates - will end Jan. 14, 2020. Microsoft will sell up to three years of extended Windows 7 support to customers running the Professional or Enterprise SKUs. Microsoft did not say what the end of the Windows 7-to-Windows 10 migration might do to revenue. While the Redmond, Wash. firm has repeatedly tagged Windows 10 as the "last" version, it has never clarified what that means money wise. The company has signaled, however - notably with its subscriptions push - that it has no intention of leaving money on the table, even if there never will be an explicit Windows X-to-Windows Y transition. "The sales motion is really about Microsoft 365," Hood said when asked what she expects from subscriptions in the future.